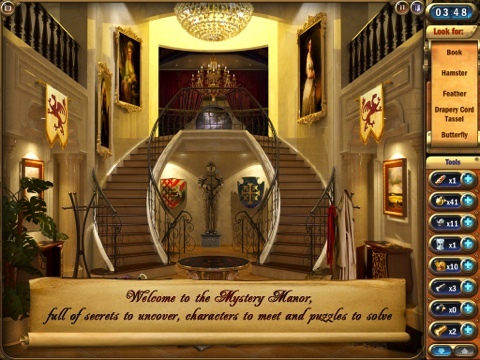 Mystery Manor: Hidden Adventure is an iPad app made by Game Insight where you have to look at rooms to find items. There are many special little things about this app that are sure to entice players, and this application is made to be sprawling and ever expanding. In this review, which was played on the original iPad, you will see if the app is worth picking up or not. The graphics in Mystery Manor are absolutely stunning. These types of graphics are iconic of other, more intensive, puzzle games like Myst and Riven. Each room looks very realistic and ornate, and there are plenty of things to look at. That’s good, because you will be looking at these rooms a lot. All of the character designs look hand-painted, and they are also stunning. Some of the rooms have moving parts, like a clock hand or other similar things, but some rooms are also static. Regardless, you will love these graphics. The background music is mostly soft and doesn’t come into play very much with this app. Most of the time it wasn’t even noticed, but it was a nice touch. You will notice little sounds as you find the items on the screen, and these noises are rather pleasant. The controls for this app are very simple. First, you have to select a mission. Most missions start with someone saying they need one or more items, and they will tell you where to go. You then select the room from the house layout screen, and then you check the room for the item. If you find the item, tap it and it will be removed from the background. If you can’t find it and need some help, you can use one of the power-ups that will show you where the item is. These power-ups are obtained by buying or finding them. This app is very social network centric. There are plenty of features to post on Facebook, to show everyone the latest items you found, and many other things. Not only that, but using social networking will improve your energy (discussed below). If you are big into social networking, then this app is good just for that. Not only that, but according to Game Insight, they will continually upgrade this app for free. That means there should always be new puzzles for players to go through. One annoying thing about this app is you need energy. Whenever you look at a room, some energy is taken. To get energy back you can social network, buy energy (with real money) or just wait. For those of us who prefer to trade time for money, you could be waiting a while. Mystery Manor: Hidden Adventure isn’t the most difficult puzzle app ever, but if you like finding items and social networking, you’ll love this app. Otherwise, you may get a little bored after a few minutes. 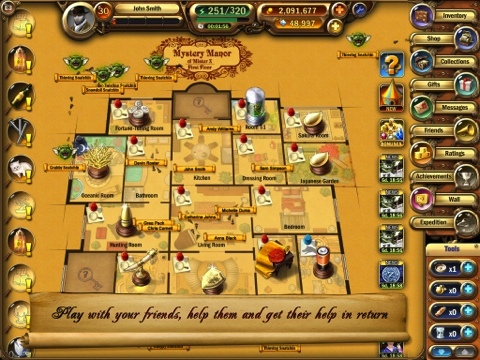 AppSafari review of Mystery Manor: Hidden Adventure was written by Darius Reimm on December 26th, 2011 and categorized under App Store, Free, Games, iPad apps, Puzzler. Page viewed 5858 times, 1 so far today. Need help on using these apps? Please read the Help Page. i really love and addicted to this game never failed to play woth it every single hour and day..